Instant noodles are a noodle dish, sold in a precooked and dried noodle block, with flavoring powder and/or seasoning oil. The flavoring is usually in a separate packet, although in the case of cup noodles the flavoring is often loose in the cup. Some instant noodle products are seal packed; these can be reheated or eaten straight from the packet/container. Dried noodle blocks are designed to be cooked or soaked in boiling water before eating, but can be consumed dry. Originally East Asia, South Asia and Southeast Asia, now found in most parts of the world. The main ingredients used in dried noodles are usually wheat flour, palm oil, and salt. Common ingredients in the flavoring powder are salt, monosodium glutamate, seasoning, and sugar. The dried noodle block was originally created by flash frying cooked noodles, and this is still the main method used in Asian countries, but air-dried noodle blocks are favored in Western countries. Instant noodles were invented by Momofuku Ando (born Go Pek-Hok) of Nissin Foods in Japan. They were launched in 1958 under the brand name Chikin Ramen. In 1971, Nissin introduced Cup Noodles, the first cup noodle product. Instant noodles are marketed worldwide under many brand names. Ramen, a Japanese noodle soup, is sometimes used as a descriptor for instant noodle flavors by some Japanese instant noodle manufacturers. It has become synonymous in America for all instant noodle products. Instant noodles were invented by Taiwanese-Japanese inventor Momofuku Ando in Japan. It was first marketed on 25 August 1958 by Ando's company, Nissin, under the brand name Chikin Ramen. Ando developed the entire production method of flash frying noodles from processes of noodle-making, steaming, seasoning, to dehydrating in oil heat, creating the "instant" noodle. This dried the noodles and gave them a longer shelf life, even exceeding that of frozen noodles. Each noodle block was pre-seasoned and sold for 35 yen. The instant noodle became ready to eat just in two minutes by adding boiling water. Due to its price and novelty, Chikin Ramen was considered a luxury item initially, as Japanese grocery stores typically sold fresh noodles for one-sixth their price. Despite this, instant noodles eventually gained immense popularity, especially after being promoted by Mitsubishi Corporation. Initially gaining popularity across East Asia, South Asia and Southeast Asia, where they are now firmly embedded within the local cultures of those regions, instant noodles eventually spread to and gained popularity across most other parts of the world. With better quality concern, manufacturers further improved the taste of instant noodles by adding flavoring powder in a separate packet. In 1971, Nissin introduced Nissin Cup Noodles, a cup noodle to which boiling water is added to cook the noodles. A further innovation added dried vegetables to the cup, creating a complete instant soup dish. It combined the functions of packaging material, cooker when boiling water, and a bowl when eating noodles. Heading off the recent rise in health-consciousness, many manufacturers launched instant noodles with various healthy recipes: noodles with dietary fiber and collagen, low-calorie noodles, and low-sodium noodles. According to a Japanese poll in the year 2000, "The Japanese believe that their best invention of the twentieth century was instant noodles." As of 2010[update], approximately 96 billion servings of instant noodles are eaten worldwide every year. China consumes 42 billion packages of instant noodles per year – 44% of world consumption, Indonesia – 14 billion, Japan – 5.3 billion, Vietnam – 4.8 billion, USA – 4 billion. Per capita, South Koreans consume the greatest amount of instant noodles, 69 per capita per year. There are three key ingredients in wheat-based noodles: Wheat flour, water, and salt. Other than the three main ingredients, USDA regulations allow instant noodles to contain palm oil, seasoning, sodium phosphates, potato starches, gums, and other ingredients. Knowing the composition of instant noodles is crucial to understanding the physical chemical properties of the product; therefore, the function of each ingredient listed above is specified below. Noodles can be made from different kinds of flours, such as wheat flour, rice flour, and buckwheat flour, depending on the various types manufacturers want to make. For instant noodles, flours which have 8.5-12.5% protein are optimal because noodles must be able to withstand the drying process without breaking apart, which requires a higher amount of protein in flour, and during frying, high protein content can help decrease the fat uptake. Gluten, which is made up of glutenin and gliadin, is the most important wheat protein that forms the continuous viscoelastic dough of noodles. The development of gluten structures and the networking between gluten and starches during kneading is very important to the elasticity and continuity of the dough. Water is the second most important raw material for making noodles after flour. The hydration of dough determines the development of gluten structure, which affects the viscoelastic properties of dough. The water absorption level for making noodles is about 30% - 38% of flour weight; if the water absorption level is too high, hydration of flour can not be completed, and if the water absorption level is too low, the dough will be too sticky to handle during processing. For instant noodles, dehydration is an important step after noodles are made because water can offer a hospitable environment for microorganisms. Depending on dehydration methods, USDA has regulation on moisture content of instant noodles: for instant noodles dehydrated by frying, moisture content cannot exceed 8%, and for those dehydrated by methods other than frying, moisture content cannot exceed 14.5%. Salt is added when making the flour dough to strengthen gluten structures and enhance the sheeting properties of dough, and it can make the noodles softer and more elastic. Salt also offers the basic salty flavor of noodles and can cover some of the off-flavor generated by flour and processing. Another function of salt is to slow down the activities of enzymes, such as proteolytic enzymes, which could interrupt the gluten structures, and microbial growth. Alkaline salt, such as sodium and potassium carbonates, could be added to noodle dough to enhance the yellow color of the product if needed because flavonoid pigments in flour turns yellow at alkaline pH levels, and the increase of pH could also influence the behavior of gluten, which could make noodle dough even tougher and less extensible (for some noodles, such as Japanese ramen, this is wanted). For making fresh noodles, the amount of salt added is 1-3% of flour weight, but for instant noodles, due to the longer shelf life, it requires higher salt content. One pack of ramen contains well over half the daily recommended amount of sodium. Kansui, an alkaline solution consisting usually of a 9:1 ratio of sodium carbonate to potassium carbonate, is added to the flour and water when making ramen to help develop several of its unique characteristics. The addition of kansui aids in the gluten development of the noodle as well as promotion of gelatinization of starches, both of which contribute to the springiness and chewiness characteristic of ramen. Additionally, the addition of kansui enhances the yellow color of ramen noodles by bringing about chromophoric shift of several compounds called flavonoids that are native to wheat flour. Frying is a common dehydration process for producing instant noodles. Therefore, oil becomes an important component of instant noodles. According to USDA regulation, oil-fried instant noodles should not have fat content higher than 20% of total weight, which means theoretically, amount of oil uptake during frying process could go even higher. Therefore, the high fat content of instant noodles is always the reason why consumers who are pursuing healthy diets would not buy this product. Palm oil is always chosen as the frying oil for instant noodles due to its heat stability and low cost. However, overall, due to the high fat content and low moisture content, instant noodles are highly susceptible to lipid oxidation, and relatively high amount of preservatives are added. Hence, to avoid the generation of off flavors and health-risking compounds, some instant noodles were dehydrated by ways other than frying to reduce the fat content. According to USDA, un-fried instant noodles should have fat content lower than 3%. Potato starches are commonly added in instant noodles to enhance gelling properties and water-holding capacities of noodles. Gelling properties could enhance the elasticity and chewiness of instant noodles, and water holding capacities could improve the smooth and shiny look of noodles after cooking and shorten the cooking time. 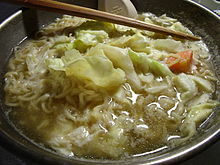 Polyphosphate is used in instant noodles as additive to improve starch gelatinization during cooking (rehydration) to allow more water retention in the noodles. Normally 0.1% of flour weight phosphate compounds are added to water before mixing and making the dough. Hydrocolloids such as guar gum are widely used in instant noodles production to enhance water binding capacity during rehydration and shorten the cooking time. Gums are dispersed in water before mixing and making noodles dough. The main ingredients in instant noodles are flour, starch, water, salt and/or a salt substitute known as kansui, a type of alkaline mineral water containing sodium carbonate and usually potassium carbonate, as well as sometimes a small amount of phosphoric acid. Specific types of noodle can be made from a mix of wheat flour and other flour such as buckwheat. There are variations to the ingredients used depending on the country of origin in terms of the salt content and the flour content. Noodle production starts with dissolving the salt, starch, and flavoring in water to form a mixture which is then added to the flour. The dough is then left for a period of time to mature, then for even distribution of the ingredients and hydration of the particles in the dough, it is kneaded. After it is kneaded, the dough gets made into two sheets compounded into one single noodle belt by being put through two rotating rollers. This process is repeated to develop gluten more easily as the sheet is folded and passed through the rollers several times. This will create the stringy and chewy texture found in instant noodles. When the noodle belt is made to the desired thickness by adjusting the gap in the rolls, it is then cut right away. Wavy noodles are made in a slow-paced conveyor belt and are hindered by metal weights when coming out of the slitter which gives the noodle its wavy appearance. If the strands are to be molded into other shapes, liquid seasoning could be added as well. Once the noodles are shaped, they are ready to be steamed for 1–5 minutes at 100 °C (212 °F) to improve its texture by gelatinizing the starch of the noodles. When steaming, the addition of water and heat breaks up the helix structure and crystallinity of amylose. Amylose begins to diffuse out of the starch granule and forms a gel matrix around the granule. Next, noodles can be dried in one of two ways: by frying or by hot air drying. Fried instant noodles are dried by oil frying for 1–2 minutes at a temperature of 140–160 °C (284–320 °F). The frying process decreases the moisture content from 30–50% to 2–5%. Common oils used for frying in North America consist of canola, cottonseed and palm oil mixtures, while only palm oil or palm olein are used in Asia. Air-dried noodles are dried for 30–40 minutes in hot air at a temperature of 70–90 °C (158–194 °F), resulting in a moisture content of 8–12%. During the drying process, the rapid evaporation of water creates pores throughout the food matrix, which allows for short cooking times in the finished product. In the case of fried noodles, the creation of pores is directly related to the uptake of fat into the noodles. More than 80% of instant noodles are fried as it gives more evenly dried noodles than hot air drying which can cause an undesired texture in finished noodles, and also taking longer time to cook. However, with fried noodles, the oil content is about 15–20% and decreases the shelf life of the noodles due to oxidation whereas in hot air-dried noodles it has only 3% oil content maximum. Before packaging with seasoning, the noodles are cooled after drying, and their quality of moisture, color, and shape are checked. Packaging of the noodles include films impermeable to air and water. There are two forms of packaged instant noodles, one in a bag with the provided seasoning in small sachets inside, or in a cup with seasoning on the top of the noodles. There are a variety of flavors to the noodles depending on which ones are added to the seasoning. Such flavors include beef, chicken, pork, shrimp, oriental, etc. In instant noodle cups, soy protein and dehydrated vegetables and meats are often added for further flavor. The shelf life of instant noodles ranges from 4–12 months, depending on environmental factors. Their stability comes from the high sodium content with low moisture, and low water activity. Instant noodles can be served after 1–2 minutes in boiled water or soaked in hot water for 3–4 minutes. Noodles from instant ramen noodle soup are continuous viscoelastic gluten matrix evenly mixed with starch, which are wheat flour, water, kansui, and salt. After mixing, kneading, compounding, and rolling, a continuous viscous noodle dough sheet is made and cut by roll slitters. The conveying belt which transports noodle dough sheet moves slower than the rotation speed of blades on the slitters; therefore, noodle dough sheet could be pressed multiple times up and down and produce the unique wavy form of instant noodles. After slitting, noodle dough sheets undergo steaming and frying, which triggers starch gelatinization to increase the water retention during cooking in boiling water to shorten the cooking time of instant noodles. Even though dry instant noodles might not show any sign of elasticity, cooked instant noodles generally have higher elasticity than other types of noodles when they are cooked, and the unique wavy form also differentiates instant noodles from other common noodles like udon or flat noodles. The wavy form of instant noodles sometimes creates random spirals after noodles are cooked, which can give a unique springiness to the noodle strands. The wavy form of instant noodles is formed when noodle dough sheets are being cut by rotation slitters. As mentioned above, due to the difference between the velocity of conveying belt and blade rotation, noodle dough sheets could be pressed by blades multiple times within a certain area, and that creates the unique wavy form of instant noodles. During pressing by heavy blades, the continuous gluten structure is ruptured at certain points and does not return to its original shape, but the remaining gluten structures are strong enough to keep it hanging; therefore, wavy noodle strands are formed and maintained during processing. Other than the physical springiness, the selection of ingredients also ensures the high elasticity of instant noodles. Instant noodles require wheat flour with high protein content to ensure noodle strands are broken during processing, which will make a more viscoelastic noodle dough and result in more elastic noodles. Furthermore, potato starch is a key ingredient in instant noodles, which has characteristics of low gelatinization temperature, high viscosity, and rapid swelling. Therefore, the addition of starch could also increase the elasticity of noodles. High salt content in instant noodles also increase the elasticity of noodle strands. Salt, dissolved in water as ions, could strengthen the interaction between gluten structures which can also increase the elasticity of noodles. The initial purpose of inventing instant noodles was to shorten the cooking time of conventional noodles. Therefore, a short cooking time could be regarded as the most decisive characteristic of instant noodles. Instant noodles are cooked in boiled water; therefore, enhancing water retention is the major method to shorten cooking time. Starch gelatinization is the most important feature in instant noodles that can enhance water retention during cooking. Two key steps in instant noodle processing serve the function to trigger starch gelatinization, which are steaming and oil-frying. Starch gelatinization occurs when starch granules swell in water with heat, amyloses leak out of starch granules, which could bind to water and increase the viscosity of gluten matrix. Steaming offers an optimal condition for the gelatinization of potato starches. After steaming, rapid oil-frying vaporize the free water, and gelatinization continues until all the free water is dehydrated. During frying, water in noodle strands migrates from central region outwards to replace the surface water that is dehydrated during frying. Therefore, a porous sponge structure in the noodle is created due to vaporization. During the migration of water, it carries thermal energy from oil to the surroundings and bound water to offer the heat for finishing starch gelatinization. Furthermore, the heat transfer during evaporation protects instant noodles from burning or being overcooked during frying. Moreover, as a common additive, guar gum can not only increase the elasticity and viscosity of noodles to enhance the mouth feel, it can also increase the water binding ability of noodles when cooking in boiling water. Hydrocolloids could bind large amounts of water; the more water they bind, the faster heat will transfer to the center of noodles. A serving of Indomie Mi goreng, with fried egg and vegetables. Instant noodles would need additional ingredients such as an egg or vegetables to add nutritional value. Instant noodles are often criticized as unhealthy or junk food. A single serving of instant noodles is high in carbohydrates and fat, but low in protein, fiber, vitamins and minerals. Lead contamination in Nestlé's Maggi brand instant noodles made headlines in India, with some 7 times the allowed limit, with several Indian states banning the product as well as Nepal. On June 5, 2015, the Food Safety and Standards Authority of India (FSSAI) banned all nine approved variants of Maggi instant noodles from India, terming them "unsafe and hazardous" for human consumption. Instant noodles are a popular food in many parts of the world, undergoing changes in flavor to fit local tastes. In 2015 the World Instant Noodles Association (WINA) noted 52 countries consumed 97.7 billion servings which China (and Hong Kong) consumed 40.43 billion and Indonesia consumed 13.20 billion servings, both countries dominated world instant noodle consumption by almost 55 percent. In Argentina, instant noodles are gaining popularity and can be found in supermarkets in most major cities. The brand is usually Sapporo Ichiban. The Maruchan brand can also be found at Disco and Coto supermarkets. Due to the recent Chinese immigration wave, specialized Chinese supermarkets offer a wide variety of instant noodle brands. The most popular manufacturer of instant noodle in Australia is San Remo Macaroni Company, whose Fantastic and Suimin brands hold a 30% market share. Other brands include Indomie, Indomie Mi Goreng, Maggi, Mr Lee's Noodles, Wai Wai, Nissin's Demae Ramen, and Nongshim's Shin ramyun served with broth. Instant noodles are often referred to as "two-minute noodles" in Australia, a reflection of their preparation time. Maggi is the most popular brand of instant noodle in Bangladesh. Instant noodles are a popular snack. They are often combined with eggs and seasonal vegetables. For a long time, the main manufacturer of instant noodle was Nissin Miojo, to the extent that in Brazil the most common name for them is "miojo", which is a Nissin trademark. Manufacturers call them "lámen", from Japanese ramen. Many other companies, such as Maggi and Nestlé, also offer this product. There are many variants, such as "Lámen Cremoso", which has a creamy sauce, and "Lámen Hot", which includes pepper, as well as yakisoba and spaghetti. Instant noodles were first introduced into Canada at least as early as 1974, with Ramen noodles as its Japanese originator. There are many brands available, including major brands from companies such as Nissin Foods, Sapporo Ichiban, Mr. Noodles, Nongshim, and Knorr. In some areas, these noodles are referred to simply by their brand names, though they are predominantly referred to as "instant noodles". These brand-name packages generally only contain one flavoring pouch. Some brands, mostly more expensive Korean, Japanese, Chinese and Thai brands, include more flavoring and separate packets for dried vegetables, flavoring contained in oil, and pepper, in addition to the soup stock. Korean brands such as Nongshim are readily available in most large grocery stores, and in some major cities, brands imported from Europe are also available. In larger grocery stores and Asian markets in larger cities, a large variety of brands and international flavors can be found, including noodles from such places as Thailand, Indonesia, and India. Instant noodles from Grace, a Caribbean food company, are available in some places. Due to the large South Asian population in some major cities, Maggi is also a popular brand. Product formats include regular plastic wrapping and in various foam food containers. Ting Yi (aka Master Kong or Kang-shi-fu, 康師傅), owned by the Taiwanese Tingyi (Cayman Islands) Holding Corporation and managed with a Japanese strategic alliance partner Sanyo Food, the third-largest player in the Japanese market. Master Kong is the largest brand, with a business scope extending to beverages (RTD) and bakeries. Uni-President (aka President or Tong-Yi, 統一), a PLC listed in Taiwan. Like Master Kong, it once had its own businesses in beverages and bakeries. However, the company recently formed a JV partnership with Hwa-Long and Nissin to distribute beverages. Uni-President's home market is Taiwan, but the company is now expanding aggressively in mainland China. Hwa-Long (華龍, i.e. Chinese Dragon), a local company allied with Nissin. Because of that relationship, Hwa-long has long been regarded as Nissin's agent in the world's largest consumer market. Recently Hwa-long, Nissin, and Uni-President formed a partnership in the beverage business in order to collectively compete against Master Kong. Bai-xiang (白象, i.e. White Elephant), a local company spin-off based on a former state-owned enterprise, which still enjoys a strong local customer base. It is a leading brand in terms of volume, and its products fall into the lower price range. In 2014, instant noodles sales declined by 9.1 percent year-on-year, due to some lower-income migrant workers shifting to higher-quality instant noodles from Korea, while Chinese instant noodle companies lured consumers with cheaper instant noodles. 40 billion packets of instant noodles are sold annually in China, which makes up about half the world's annual consumption of instant noodles. Instant noodles were introduced in 2010 by Nissin Foods of Japan. On September 13, 2013; Nissin Foods opened its commercial office in Bogotá, investing US$ 6 million in its corporate offices. Virtually all supermarkets sell instant noodles of some sort, but they tend to be Westernized and come in foam containers, costing upwards of 5 kroner. Ethnic stores and specialty shops offer the most popular alternative, Yum Yum, whose prices range from 3–4 kroner; "3 for 10" offers are nearly universal. Its popularity has been sufficient to become a generic brand name. Mama, another brand from Thailand, is the second most popular Eastern brand but has a much smaller market share. Wai Wai, a brand from Nepal, is also available. Most Danish supermarket instant noodles contain Monosodium glutamate (MSG) as a flavor enhancer. Instant soups have a long tradition in Germany, back to the 19th century, with, for example, the inventions of Justus von Liebig, or Maggi products. Instant noodles as discussed here, however, were relatively unknown in Germany until the 1990s, but they have since continually gained in popularity. There are two types of ramen in Germany: the first, generally called "Instant-Nudeln" (instant noodles), tend to be a mild, Westernized version and come in flavors such as chicken, vegetable, beef and button mushroom. The second type is called "Ramen" and is quite similar to instant noodles as they are known in Asia. German "Ramen" was originally considered an ethnic food and was only available in specialty stores. Since the mid-1990s, it has become available at German supermarkets. The most popular brands are Yum Yum, Thai Chef, Nissin Cup Noodles, and Maggi. Cantonese people have a long history of cooking yi mein, a noodle invented in the Qing Dynasty. However, modern instant noodles were only publicly introduced to Hong Kong in the late 1960s by Winner Food Products Ltd as "Doll Noodles" (Chinese: 公仔麵). It was named "Doll Noodles" because the logo is designed in the shape of a doll in Cantonese (Chinese: 公仔麵). [not specific enough to verify] Although the company was bought out by Nissin in 1984 and other brands from many different countries have become widely available, the name "Doll Noodles" remains ubiquitous and has since become a synonym for instant noodles, irrespective of brands. It is usually taken as a derogatory term for poor, busy and/or unhealthy lifestyles, as these noodles have become a part of daily life in Hong Kong. Most supermarkets offer a vast choice of both domestic and international brands, including Shin Ramyun of South Korea, Nissin Chikin and Demae Itcho of Japan, Indomie of Indonesia, Koka of Singapore and Mama of Thailand. Besides instant wheat noodles, supermarkets also sell instant rice noodles and Cantonese egg noodles. Premium instant noodles can also be found. Some of them are priced at more than HK$20 a pack. Some noodles are also marketed as a snack which need not to be cooked; consumers ingest the noodles directly out of the packaging similar to crisps. The most common brand for this is Fuku and Baby Star. Hungary is 43rd in the world in the consumption of instant noodles according to the World Instant Noodles Association (WINA), having consumed 20 million packages/cups of noodles in 2014. In 2016, India was the fourth largest consumer of instant noodles after Japan, Indonesia and China. India is also the most attractive instant noodles market in the world. On June 5, 2015, the Food Safety and Standards Authority of India (FSSAI) banned all nine approved variants of Maggi instant noodles from India, terming them "unsafe and hazardous" for human consumption. Although in November 2015, Maggi instant noodles made a return in the Indian market after the ban was lifted. India is Nestle Maggi's largest market. Other brands include instant noodles from Patanjali Ayurved, Ching's Secret, Knorr, Sunfeast Yippee, Top Ramen, Indomie, Joymee, Nissin, Horlicks, Wai Wai and several domestic and regional brands. An early instant noodle in Indonesia was "Supermi", introduced in the 1970s by Indofood Sukses Makmur, the largest instant noodle producer in the world. It later introduced two additional brands – "Indomie" and "Sarimi". Currently, Indofood Sukses Makmur has a market share of about 70% of Indonesian instant noodle production. In 1999, the figure was about 90%; their market share declined following the introduction of "Mie Sedaap" by Wings Food in 2003. Strong local preferences contribute to the low volume of sales of Japanese and other foreign instant noodles in Indonesia. However, spicy Korean noodles appeal to the locals and are gaining traction in the market. Indonesians generally prefer noodles with strong flavors. Popular flavors include Chicken curry, Onion and Chicken, Bakso (beef meatball), Mie Goreng and Chicken Soto, a traditional Indonesian chicken soup. In the past, Indomie tried to produce 30 different flavors to reflect various traditional dishes of Indonesian cuisine, but the product line was discontinued after disappointing results with only several popular variants remain in production. Indonesians usually add ingredients such as simple boiled Chinese green cabbage, boiled or fried egg, corned beef, bottled sambal chili sauce, pepper or fried shallots to their meals. Most of the market share is owned by the product Indomie Mi goreng, A dry instant noodle meant to replicate the traditional Indonesian dish Mie goreng, or fried noodles. Other variants of popular instant noodles in Indonesia includes Mie Gelas, which is sized so it could be served in a drinking glass, and Pop Mie, which is similar to Cup Noodles. Although originally targeted for family at home; nowadays, instant noodles are also served in warung (simple shop). These shops serving instant noodles are customarily called warung indomie, despite the fact that the brand of instant noodles served there are not necessarily Indomie. Japan is the country of origin of instant noodles. Instant noodles remain a "national" light food. The average Japanese person eats 40 packs of instant noodles per year. After their invention by Momofuku Andō in 1958 (shōyu (Soy sauce) flavor), instant noodles became very common in Japan. In the 1970s, makers expanded their flavors to include such examples as shio (salt), miso, or curry. Beginning in the 1980s, makers also added dried toppings such as shrimp, pork, or eggs. Today, instant noodles are divided into two groups: "traditional" cheap (¥100 to ¥200) noodles with few toppings and expensive (¥200 to ¥350) noodles with many toppings, which are often packed into a pouch. Various kinds of instant noodles are produced, including ramen, udon, soba, yakisoba, and pasta. Nissin Food Products 日清食品, whose products include Chicken Ramen and Cup Noodles, has a 40.4% market share As of 2005[update]. Tōyō Suisan 東洋水産, under the brand name Maruchan, whose products include Akai Kitsune and Midori no Tanuki, has a 19.2% market share. Sanyō Foods サンヨー食品, Sapporo Ichiban, has an 11.5% market share. Myōjō Foods 明星食品, Charumera, has a 9.9% market share. Acecook エースコック, Super Cup, has an 8.3% market share. Ramyeon (라면), often translated as instant noodles, is a Korean instant noodle dish made by boiling a precooked and dried noodle block with flavoring powder or sauce. The stereotype of a South Korea ramyeon is red and spicy, with or without common toppings such as egg, chopped scallions and chili peppers. Best selling ramyeon in 2016 include Shin Ramyun (Nongshim), Jin Ramen (Ottogi), Ansungtangmyun (Nongshim), Samyang ramen (Samyang Food), and Neoguri (Nongshim). The word ramyeon (라면) derived from the Chinese lāmiàn (拉麵) or lǎomiàn (老麵). Ramyeon is not considered to be a Sino-Korean word. Ramyeon is very popular in South Korea, with nearly every convenience store selling some type of ramyeon. Due to the ease of preparation and low cost, ramyeon is often eaten by college students, campers, and low-income households. The first instant ramyeon in South Korea was introduced by Samyang Food in 1963 with technical assistance from Myojo Foods Co. Japan, which provided manufacturing equipment. The Lotte Food Industrial Company (currently named Nongshim) invigorated the Korean ramyeon market in 1965. Since the 2010s, Korean stores and restaurants have spread over the whole world. Baguio City has several Korean restaurants serving Ramyeon. In South Korea, instant noodles are more common than non-instant noodles; the word ramyeon (Korean: 라면), generally means the instant kind. Japanese Ramen is often referred to as "Japanese ramyeon" or "Japanese noodles". Lot of South Korean food stalls make instant ramyeon and add toppings or other main ingredients for their customers. Ramyeon is typically spicy and salty. Shin Ramyun (신[辛], literally "spicy") is the best-selling brand in South Korea. It has also become popular in China and the United States. The leading manufacturer of ramyeon in South Korea is Nong Shim ([農心], literally "Farmer's Heart"), which exports many of its products overseas. In 2004, over 600,000 boxes of Shin brand Ramyeon were sent to North Korea as part of the aid relief program when the Ryongchŏn train station exploded, injuring many North Koreans. Insider sources have said that most of it was sold in North Korean black markets, making its way to Pyongyang, instead of being distributed as aid. North Korean visitors to China also frequently purchase South Korean ramyeon from Chinese stores, where Shin Ramyeon is known as "Korean Tangmi Ramyeon." Indigenous production of Ramyeon in North Korea began in 2000. The first Ramyeon brand was "kkoburang guksu," which literally means "curly noodles" in Korean. Later, a joint venture by North Korean and Hong Kong-based companies began producing "jŭksŏk guksu," (Korean: 즉석 국수, 卽席 국수) which literally means "instant noodles." Ramyŏn is popular among North Korean elites who live in Pyongyang and Nampo. In contrast to hot and spicy South Korean Ramyeon, North Korean Ramyŏn has a much milder and brothier flavor. Maggi has practically become synonymous with instant noodles. In many places, all instant noodles are referred to as "maggi," regardless of the brand. Popular flavors include curry, chicken, tom yum, and asam laksa. Both soup-based and dry variants are available. Indomie, Nissin, Cintan and Mamee brands of instant noodles are also well loved by Malaysians, Singaporeans and Bruneians. Though instant noodles are usually eaten at home, they are also very popular as restaurant or cafe meals, especially in Mamak shops similar to Hong Kong's "cha chaan teng" cafes. These noodles are usually stir fried with egg and fish cake, using a minimum amount of monosodium glutamate. In recent years, instant noodle manufacturers have tried to introduce low-MSG seasonings, as well as new processes that do not require frying for the noodles, and have introduced new flavors such as chilli crab and seafood. Apollo (brand name) noodles are popular in Mauritius. Popular flavors include shrimp, curry, chicken and vegetable. This Mauritian brand is today also widely available in some Western markets such as France. Presto (brand name) is a brand of instant noodles produced by HV Industries Ltd. Presto noodles are exported to Europe, Australia, East and South African Markets, and is the highest selling brand in Madagascar. Instant noodles are very popular in Mexico, where they are often viewed as a snack-grade food. Flavors such as lime and chili are popular, often combined with shrimp. It is available in many grocery stores and convenience stores through all the country. This kind of soup was introduced in the 1980s by the Maggi Corporation as "Instant Maggi Ramen", marketed in a small plastic bag with artificial flavors, but it did not become popular until cup noodles were introduced in 1990 by Maruchan. Due to this popularity, the instant noodles are often referred to simply as "Maruchan". Today, many local brands such as "La Moderna" and "Herdez" have developed their own cup noodles, along Nissin, which is also a newcomer. In the early 2000s, Maggi introduced four instant noodles flavors, like tomato pasta or chicken with green tomatoes, but they were soon discontinued. Instant noodles are famous in Nepal. In the early 1980s, Gandaki Noodles (P.) Ltd. of Pokhara city, introduced Rara, a white instant noodles named after the largest lake of Nepal. It was a fair success among urban population. Then in around 1985, Chaudhary Groups(CG) entered the market with Wai Wai. Wai-Wai noodles, a brown, spicy and precooked noodle, became a big hit among the people. Over the years, its popularity has grown heavily and consist of a major part of the dry foods sold in Nepal and are available in any part of the country. The Quality control office of Nepal withheld Nepal quality marks for wai wai in 2012. Wai-Wai noodles, Golmol produced by CG. Wai Wai is popular in India too. CG has established its factories in India. Since its introduction in 1988, Indomie is the most popular instant noodle brand in Nigeria. Instant noodle brands are now eaten in most households across the country. By 2008, nine other brands of noodle had appeared on the market. Affirming Indomie's hold on the market, Christopher Ezendu, a distributor at the popular Oke-Arin market on Lagos Island, reported that these other brands are aspiring to be like the market leader. In 2013 a wholly owned and managed Nigerian company based in Abuja, Royal Mills and Foods limited, launched a new brand of instant noodle, De-Royal Instant Noodles with two flavors (chicken and onion chicken), in Nigeria. According to the World Instant Noodle Association, Nigeria was the 13th largest consumer of instant noodle in the world in 2007. Instant noodle is not a traditional part of Pakistani cuisine, but it showed rapid growth over the review period and became very popular because it is easy to prepare within minutes. Due to the busy lives of urban consumers, they prefer a quick and convenient meal which was provided by noodles. It continued to become popular among children and the younger generation as a mini meal with many flavors such as masala and chicken. There are three challenging brands of instant noodles in Pakistan. Nestlé's Maggi which was the first brand to enter market in 1992, followed by Knorr of Unilever in 1993 and in 2012 Shan Food Industries introduced Shoop. Knorr is leader with 55% market share and that of Maggi is 45%. Maggi Noodles are available in six flavors: Chicken, Chatkhara, Masala, Lemon Chaska, Karara and Bar-B-Q. In 2011, Knorr launched Soupy Noodles, along with two other variants, Chicken Delite and Mast Masala. Knorr Noodles have become the brand of choice for kids over the years. In Peru, Aji-no-men brand ramen had been the only brand sold for a long time. Recently, Maruchan and Nissin ramen became available too, in a wide range of flavors, including beef, chicken, chicken with greens, hen, spicy hen, creole-style hen, shrimp, and oriental-style. There are many local and imported brands of instant noodle in the Philippines, which are locally known as "instant mami" (after a Philippine version of chicken noodle soup). Brands available in the Philippines include Lucky Me!, Payless, Nissin, QuickChow, Maggi and Ho-Mi. They are sold in packets, sealed paper cups, or sealed foam food containers. Instant noodles are popular as a quick snack or for breakfast because of their fast preparation and affordability. People in the Philippines sometimes add a fresh egg directly into the instant noodle either in the pot or the bowl. Another popular variation is the instant pancit canton, stir-fried noodle which is boiled and drained to which a flavoring powder, soy sauce, oil and carrot and celery pieces are added. Popular variations include spicy, soy-sauce-calamansi, and sweet-spicy. Instant noodles began appearing on Polish store shelves during the early 1990s. Despite being called "Chinese soup", the first brands on the market were produced in Vietnam and had a somewhat spicy, garlic-flavored taste. The noodle packages contained pouches of flavored soup base, spicy oil, dried vegetables or even minuscule shrimps. The product gained particular popularity among students due to its affordability and convenience. "Kaczka łagodna" (Mild duck), "Kurczakowa łagodna" (Mild chicken) and "Krewetkowa ostra" (Spicy shrimp) were the most common flavors. Today, the local Kim Lan and worldwide Knorr brands offer varieties ranging from cheese-and-herb flavored noodles to local Polish specialties like barszcz czerwony or żurek. Ngoc Tu Tao, who emigrated to Poland from Vietnam and established the Tan-Viet Group in 1990, is credited with introducing the instant noodle to Poland. His VIFON brand holds a 35% share of the Polish instant soup market, selling over 100 million packages a year. Ngoc Tu Tao has appeared in Wprost magazine's annual ranking of the 100 most wealthy Polish citizens. Inexpensive supermarket private-label brands and regular mid-market products do not differ much in taste, while their prices can range from PLN 0.8 to PLN 2.00. Noodles packaged in foam bowls are slightly more expensive, priced from PLN 4.00 to PLN 8-9. Russia's most popular instant ramen brands are the local brand Rollton and the Korean brand Doshirak (Initially named Dosirak, but was rebranded after it was discovered that it sounds unpleasant in the Russian language). Instant noodles have been popular in Russia's Far East region since the late 1980s and made their way west in the early 1990s. In Russia, like most noodle products, they are still considered a lesser-quality option to turn to in lean economic times. They are popular among college students and homeless as a regular meal. Since its introduction to Saudi Arabia, the brand "اندومي" (Indomie) dominated the market; currently the brand "تويا" (Toya) is popular. Instant noodles are popular among children and young adults. However, it is not usually served as a meal in households. Instant noodles have become commonplace in South Africa since the 1990s, when they were first introduced to the general consumer market. While various brands are available, the most common is Maggi 2 Minute Noodles. Because of their low cost, instant noodles are popular in South Africa's poorer communities. They are also popular among students and office workers as a quick snack. In South Africa the term "Ramen" is not used to describe Instant Noodles but rather the traditionally thicker noodles used in authentic Japanese cuisine. Maggi, Alli, Delmenge and Prima are the most prominent instant noodle brands in Sri Lanka. A variety of forms of instant noodles are available on the market and appeal to local tastes. Instant noodles in the form of rice noodles or kurakkan noodles as well as curry-flavoured and kottu-flavoured noodles for example are widely available. Instant noodles have been widely available in Swedish supermarkets since the mid 1990s and are very popular, especially among students. The most common brands include Nissin's Demae Ramen, Samyang, Euroshopper, Eldorado and ICA. Other brands include Mr. Cup cup noodles and Little Cook. Instant noodle inventor Momofuku Ando was born in Taiwan. According to statistics from the International Ramen Manufacturers Association, Taiwan is the world's 12th largest instant noodle market, with an annual NT$10 billion (US$300 million) in sales. This translates into an annual total of 900 million packs, or 40 per person. Uni-President (aka President or Tong-Yi, 統一) takes the largest market share of instant noodles in the country, and is a major player in the global instant noodle market. Uni-President (aka President or Tong-Yi, 統一) is the first instant noodle maker in Taiwan. Its first and most famous product is Rouzaomian (肉燥麵). Uni-president has the greatest market share in Taiwan and is also one of the largest instant noodle makers in Mainland China. Wei Lih (維力) is famous for its Zhajiangmian (炸醬麵). Ting Yi (aka Master Kong or Kang-shi-fu, 康師傅) is also the biggest instant noodle maker in Mainland China. Due to their ubiquity, instant noodles were chosen as a vehicle for dietary fortification by a joint effort of the Federation of Thai Industries, instant noodle producers, and the Ministry of Public Health about 10 years ago. The vitamins and minerals added are iron, iodine, and vitamin A. Unlike Japanese or Malaysian instant noodles, Mama noodles are often used to cook different dishes using only the noodles, leaving out the seasoning. The typical method of cooking is by adding boiled water, but Thais typically add meat, pork, chicken or egg to spice up the instant noodles. Sometimes they will cook the noodles and combine the noodles in a dish called a noodle salad known as "yum Mama". This dish is often prepared with meat balls, tomatoes, onions, and lettuce. Another method is to stir fry the cooked noodles with pork, chicken, eggs, and vegetables to give the noodles extra flavor. They are also sometimes consumed directly as a snack without further cooking by crushing the noodles in the packet, adding seasoning powder in the packet and shaking the packet to coat the crushed dried noodles evenly with the seasoning. Instant noodle products have become successful in Thailand, because they are cheap, easy to eat, can be easily found, and offer a range of flavors. Recently some brands of instant noodles include real dehydrated meat such as pork or beef. The average retail price is about six baht for the regular size and 10 baht for Yum Yum Jumbo packs. For years, sales of MAMA noodles was considered a barometer of the Thai economy, with consumption rising when times were lean. This has not been the case recently. In 2014, when the political crisis slowed Thailand's economic growth to 0.9 percent and eventually led to a military coup, the growth of MAMA noodle sales hit a low of one percent. In 2015, when the military government could not lift the country beyond an estimated 2.8 percent growth, sales of MAMA noodles only grew 0.4 percent—a record low. Saha Pathanapibul's vice-president, Vathit Chokwatana, attributed the poor sales to falling commodity prices, which have weakened the purchasing power of rural people. Various brands of instant noodle are sold through both toko and non-specialty supermarkets, including Saimin, Indomie Mi Goreng, Maggi, Thai varieties such as Mama and Yum Yum, and some more Western alternatives, such as Conimex and Good Noodles by Unox. Both cup and packet varieties are available. Instant noodles have been quite popular in Ukraine in the past 10 years because they are cheap and can save time. Mivina noodles can be cooked as soup or eaten dry; dry instant noodles are as popular in Ukraine as potato chips and croutons. Mivina is rivaled by the Russian Rollton, which also produces instant noodles for quick soups. UAE is one of the most attractive Instant Noodles market in the world. The most significant brand in UAE is Maggi, with the flavour likes biryani, curry, cheese and chicken. Apart from Maggi, other brand also available on the market like Panzani, Barilla, Indomie and Yupi. A common form of instant noodles in Britain is Pot Noodle, a cup noodle first marketed by Golden Wonder in the late 1970s, and acquired by Unilever in 1995. These use artificial flavorings and are generally suitable for vegetarians (there is no chicken in Chicken Pot Noodles, for example) and are sold by virtually every major supermarket chain, general groceries shops, and convenience stores. Packet noodles such as Batchelors' Super Noodles are also sold. Several of the larger supermarkets sell eastern brands such as Nissin, Koka noodles and Shin Ramyun, which once could only be found in Asian groceries. Larger retail chains may offer their own brand in basic packaging and a variety of flavors, e.g. Asda, while noodles such as Maggi can also be found in many groceries, but are less widespread. Kabuto Noodles, launched in 2010, was the UKs first up-market instant noodle brand  followed by Itsu and Mr Lee's Noodles. In the United States, instant noodles were first available by Nissin Foods in 1971. In 1972, Nissin Foods introduced "Nissin Cup Noodles" in a foam food cup, which led to an upsurge in popularity. Soon after, many other competing companies were offering similar instant noodle products. Today, in the U.S., the instant noodle is commonly known as ramen, after the Japanese dish on which it was originally based, and it comes in a variety of mostly meat-based flavors such as beef, chicken and shrimp. Some prominent brands are Nissin Foods brand Top Ramen (originally Top Ramen's Oodles of Noodles), Maruchan Ramen, and Sapporo Ichiban. A wide range of popular brands imported from other countries are available at many Asian grocery stores and some supermarkets. Instant ramen noodles are extremely popular among students and other people of low income, due to their ease of preparation and unusually low cost. With Top Ramen brand, Shrimp is pink, Oriental is blue – though now it's called "Soy Sauce." A new brighter logo helps emphasize the two vegetarian flavors: Soy Sauce and Chili. While price varies throughout the U.S., generally several packages can be purchased for 25 cents or less. In the prison system, ramen packets have become a form of currency, comprising a mainstay of the informal economy there. Instant noodles are popular in Vietnam, where they are often eaten as a breakfast food. Both wheat and rice noodles are common. Acecook Vietnam, Masan Food and AsiaFoods are leading producers of instant noodles. Popular Vietnamese instant noodle soups include Oriental, bánh đa cua, bún bò Huế-flavored, phở, and hủ tiếu Nam Vang, a Phnom Penh-style noodle. ^ a b c d Burmon, Andrew (11 June 2015). "Instant Noodles Will Either Save the World or Ruin It". Inverse. Retrieved 22 February 2018. ^ Forshee, Jill (2006). Culture and Customs of Indonesia. Westport, Connecticut: Greenwood Press. p. 137. ISBN 978-0-313-33339-2. ^ Beech, Hannah (13 November 2006). "Momofuku Ando". Time. ^ "Nissin Foods – About Us". 22 November 2018. Archived from the original on 24 October 2007. ^ "Inventor of the Week Archive: Momofuku Ando". MIT. ^ Bartholomeusz, Rachel (11 May 2016). "Embrace the instant noodle". Special Broadcasting Service. Retrieved 22 February 2018. ^ "History of instant noodles". World instant noodles association. Retrieved 7 March 2019. ^ a b "National Trends in Instant Noodles Demands". World Instant Noodles Association (WINA). Archived from the original on 6 June 2012. ^ a b c d e f g h Fu, Binxiao (2007). "Asian noodles: History, classification, raw materials, and processing". Food Research International. 41 (9): 888–902. doi:10.1016/j.foodres.2007.11.007 – via Elsevier Science Direct. ^ a b c USDA (6 November 2010). "Commercial Item Description Soup, Noodle, Ramen, Instant" (PDF). USDA. Retrieved 16 December 2016. ^ "7 Fast Facts About Instant Ramen". Spoon University. 2 April 2015. Retrieved 15 November 2017. ^ Li, Man; Sun, Qing-Jie; Han, Chuan-Wu; Chen, Hai-Hua; Tang, Wen-Ting (2018). "Comparative study of the quality characteristics of fresh noodles with regular salt and alkali and the underlying mechanisms". Food Chemistry. 246: 335–342. doi:10.1016/j.foodchem.2017.11.020. PMID 29291858. ^ a b Gulia, Neelam; Dhaka, Vandana; Khatkar, B. S. (1 January 2014). "Instant Noodles: Processing, Quality, and Nutritional Aspects". Critical Reviews in Food Science and Nutrition. 54 (10): 1386–1399. doi:10.1080/10408398.2011.638227. ISSN 1040-8398. PMID 24564594. ^ Belitz, H.-D.; Grosch, Werner; Schieberle, Peter (15 January 2009). Food Chemistry. Springer Science & Business Media. ISBN 9783540699330. ^ Mellema, M. (2003). "Mechanism and reduction of fat uptake in deep-fat fried foods". Trends in Food Science & Technology. 14 (9): 364–373. doi:10.1016/s0924-2244(03)00050-5. ^ Rombouts, Ine; Jansens, Koen J.A. ; Lagrain, Bert; Delcour, Jan A.; Zhu, Ke-Xue (2014). "The impact of salt and alkali on gluten polymerization and quality of fresh wheat noodles". Journal of Cereal Science. 60 (3): 507–513. doi:10.1016/j.jcs.2014.09.003. ^ "Stay away from instant noodles to keep healthy". Consumers Association of Penang. Retrieved 7 December 2012. ^ "Instant ramen noodles are low in fiber, vitamins and minerals and high in carbohydrates. The package comes complete with seasonings that are typically very salty. Ramen Noodles and Chronic Illness; accessed ??? ^ Instant noodles are a highly processed food which lack nutritive value. Instant noodles are high in carbohydrates, sodium and other food additives, but low on essential elements such as fiber, vitamins and minerals. Stay Away from Instant Noodles to KeepHealthy; accessed ??? ^ Hope Ngo (23 February 2001). "CNN.com – Instant noodles a health hazard: report – February 23, 2001". CNN. Retrieved 7 November 2012. ^ "The Kathmandu Post :: Maggi noodles banned in Nepal". ^ a b "FSSAI orders recall of all nine variants of Maggi noodles from India". FirstPost. 5 June 2015. Retrieved 5 June 2015. ^ "Indonesia Named 2nd Biggest Consumer of Instant Noodles". 2 June 2016. ^ "El rey de los fideos". www.dinero.com. Retrieved 16 May 2017. ^ Tiempo, Casa Editorial El. "Venimos a Colombia a crear un mercado: Nissin Foods". Retrieved 16 May 2017. ^ Lo, York (2 February 2018). "Instant Noodles, Enduring Success: the story of Winner Food Products, maker of Doll noodles and frozen dim sum, Vecorn Oil and others". The Industrial History of Hong Kong Group. Retrieved 2 April 2018. ^ 程乃珊. 香港特色的饮食符号. 沪港经济.2009,(1): 72-73. ^ "Doll instant noodles". Do You Remember?. 9 October 2010. Retrieved 2 April 2018. ^ "Expanding Market: Global Demand for Instat [sic] Noodles". World Instant Noodles Association (WINA). Archived from the original on 6 June 2012. Retrieved 8 February 2016. ^ a b Annual Report 2014 (PDF). Thai President Foods. 2015. Retrieved 9 June 2015. ^ GmbH, finanzen.net. "Instant Noodles Market: Global Industry Trends, Share, Size, Growth, Opportunity and Forecast2 - Markets Insider". ^ "Indiaâ€™s Instant Noodles Market - Opportunities and Upcoming Projects -". www.mordorintelligence.com. ^ "Maggi is back, stores see rapid sale after relaunch". The Indian Express. 10 November 2015. Retrieved 12 March 2016. ^ "10 Best instant noodle brands in India". W Live News. 20 April 2017. Retrieved 4 November 2017. ^ "How many calories in a cup ramen?". Retrieved 19 July 2016. ^ 김, 소윤 (7 March 2017). "지난해 라면 4사 성적표…농심 신라면 '부동의 1위'". Seoul Finance (in Korean). Retrieved 30 March 2017. ^ a b "ramyeon" 라면. Standard Korean Language Dictionary (in Korean). National Institute of Korean Language. Retrieved 30 March 2017. ^ "Brief History". SAMYANGFOODS Co., Ltd. Archived from the original on 17 June 2004. ^ "Brand History" (in Korean). SAMYANGFOODS Co., Ltd. Archived from the original on 22 June 2004. ^ Samyang Foods "Archived copy". Archived from the original on 17 June 2004. Retrieved 21 September 2015. CS1 maint: Archived copy as title (link). Retrieved 4 July 2008. ^ Park, Ju-yeon (13 December 2015). "invigorating Korean market of ramyeon". ^ "10 Consumer Hits 1950–2007". The Korea Times. 16 October 2007. Retrieved 21 October 2007. ^ 신미진. "오뚜기 `쇠고기미역국 라면`, 500만개 판매 돌파 - 매일경제". mk.co.kr (in Korean). Retrieved 12 April 2019. ^ "Gandaki Noodles (P.) Ltd". Nepalhomepage.com. Retrieved 7 November 2012. ^ "Chaudhary Group". Chaudhary Group. Retrieved 7 November 2012. ^ "ECS NEPAL | The Nepali Way". Ecs.com.np. Archived from the original on 12 May 2013. Retrieved 7 November 2012. ^ Salokya, on 19 October 2012 (19 October 2012). "वाईवाई र नेबिको बिस्कुट गुणस्तरविहीन « Mysansar". Mysansar.com. Retrieved 7 November 2012. ^ "Himalayan Snax &". Himalayansnax.com. 10 August 2012. Retrieved 7 November 2012. ^ "Asian Thai Foods". Asian Thai Foods. Retrieved 7 November 2012. ^ "Smart food and Snacks". Smart Food and Snacks. Retrieved 26 April 2014. ^ "Noodles in Nigeria". euromonitor.com. ^ "Welcome to Indomie – Brand Legacy". Dufil.com. Archived from the original on 16 November 2012. Retrieved 7 November 2012. ^ "The Noodles War". Thenewsng.com. 21 July 2008. Retrieved 29 May 2009. ^ "Firm floats N4b noodles' production unit". The Guardian. ^ "Expanding Market | World Instant Noodles Association". Instantnoodles.org. Archived from the original on 6 June 2012. Retrieved 29 May 2009. ^ "Noodles in Pakistan – trend". Euromonitor International. Retrieved 8 April 2014. ^ a b "Instant noodles in Pakistan". AURORAMAG. Archived from the original on 9 April 2014. Retrieved 8 April 2014. ^ "Shooping into instant noodles". AURORAMAG. Vaneesa D'Souza. Archived from the original on 9 April 2014. Retrieved 8 April 2014. ^ "Culinary & Food: Maggi Noodles". Nestlé Pakistan. Retrieved 8 April 2014. ^ "Knorr brand in Pakistan". Unilever Pakistan. Retrieved 8 April 2014. ^ "Internet Archive Wayback Machine". 8 December 2007. Archived from the original on 8 December 2007. Retrieved 7 November 2012. ^ May.23,2005 19:42 KST (23 May 2005). "Digital Chosunilbo (English Edition) : Daily News in English About Korea". English.chosun.com. Archived from the original on 8 December 2007. Retrieved 29 May 2009. ^ "Sri Lankaâ€™s Instant Noodles Market - Opportunities and Upcoming Projects -". www.mordorintelligence.com. ^ "Food evaluation" (PDF). ipht.lk. ^ Hwang, Jim. "Three Minutes to Go". Archived from the original on 9 November 2013. ^ a b c d Yee, Tan Hui (2 February 2016). "Thailand's queen of instant noodles takes a hit due to slowing economy". Straits Times. Retrieved 2 February 2016. ^ "Triple fortification of instant noodles in Thailand". ^ Kongkachuichai R; et al. (2007). "Effects of various iron fortificants on sensory acceptability and shelf-life stability of instant noodles". Food Nutr Bull. 28 (2): 165–72. doi:10.1177/156482650702800205. PMID 24683675. ^ "Why ramen is so valuable in prison". YouTube. Vox. Retrieved 16 November 2018. ^ Hai, Thuy. "SGGP English Edition- Vietnam instant noodle market on the boil". Saigon-gpdaily.com.vn. Retrieved 7 November 2012.